Why am I wearing a lab coat in the above picture? Because I am starting my dietetic internship in about 2 weeks and am going to need one for the hospitals! Pulse Uniform is a company that sells all different lab coats and scrubs. For my review, I was sent the Grey's Anatomy junior fit 34 inch two pocket medical lab coat. I love the coat! It is a lot thicker than most lab coats. It's almost like a denim material which will be nice for the hospital. I also like how it is a junior fit so that it's not super baggy on me. Wearing this lab coat makes me very excited for my internship. Pulse Uniform recently made a lot of updates on their site. I think that it is easy to navigate. On the top of the screen, you can choose womens or mens scrubs or lab coats. 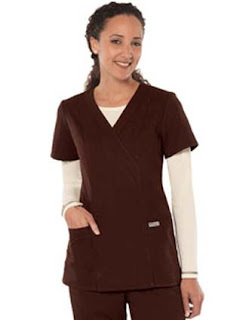 Then under lab coats, you can choose whether you want short, long, fashion, colored, etc. You can also choose by brand. Since I was specifically looking for fitted long lab coats, this site made it very easy to find what I was looking for. I think that any medical professional would have an easy time finding what they need and there are options for everyone. Thanks Pulse Uniform for providing me a great lab coat for my dietetic internship! I'm so excited for you to start your internship! Yeah its very fitted which is so nice if you're small! I also like there products and I admit that the thickness of the material is much better. it wont be easily thorn apart. Hi Amanda! I really like your site. I just found it today and there is a lot of great content! I just matched with a Dietetic Internship and was wondering what your thoughts are with embroidery on a medical lab coat? I know I'm not supposed to use the term RDE but I'm not sure what else I could do. Please let me know if you have any suggestions! Thanks!